As we approach EGYPS 2018 Sandra Antonovic, Chief Operating Officer at Reflex Marine, reflects on EGYPS 2017 and developments in the region. Reflex Marine provide safe access solutions to the offshore oil and gas and marine industry. Best known for the FROG transfer carrier, which is now an industry benchmark, the company continue to innovate to improve solutions for the industry. With global offices, Reflex Marine has been at the forefront of development in marine transfer for the past two decades and is involved in over one million safe transfers each year. Sandra Antonovic, Chief Operating Officer at Reflex Marine speaks to Pipeline Magazine’s Nadia Saleem about new opportunities in Egypt and Middle East. What attracted you to Egypt and what are your plans for expanding business here? Egypt is a natural hub for a company like Reflex Marine. While we do like to grow our global operations and client base, we are very much aware of the importance (and necessity, really) to adapt to each region and sub-region. Having a unique geographical position connecting Middle Eastern countries in the Arabian Gulf; Black Sea and Eastern Mediterranean with the rest of the Europe and the World; Egypt quickly became a focal point of our regional and global strategy. 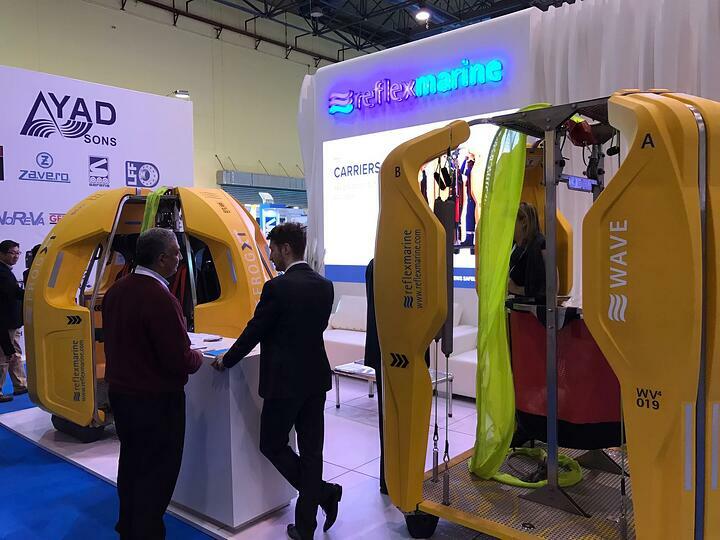 Egypt brings industries together and it makes it easy for companies like Reflex Marine to see the potential beyond oil and gas. Egypt offers opportunities in marine sector, tankers and shipping; but also in offshore civil construction and beyond. We will remain focused on Egypt. We chose Egypt to be the first country in which we exhibit our products this year – it’s strong message, both regionally and globally. What are your views on the changing regulatory and tax environment in Egypt? We understand that things changed in a way that can impact our business. We are doing our best to support our local partners, and we adopted a very flexible, locally driven market and commercial approach. Can you provide us with a business update for Egypt? We are working with local partners and together we market our products and services. The base of our global approach – finding local partners and recognizing the local culture, customs and way of doing business – is working really well in Egypt. Exhibiting at EGYPS gave us the opportunity to present our products and spend more time talking to people from the industry. It also gave us the opportunity to further embrace local culture and keep learning. Our local partners are a great support to us, and together we are helping companies offshore by bringing down their costs and improving the safety of their crew transfer operations. Egypt is a perfect combination of oil and gas and maritime industry to close the circle of everyone working offshore. For us to be able to expand in all those offshore sub sectors is very special; it is both a challenge and an opportunity. Where do you see potential for growth? We are already active in the Red Sea and the Nile Delta – we will keep improving and growing our focus there. We plan to focus a lot on Suez as well, and we will soon be launching another product very suitable for tanker and marine sector. We remain focused on helping companies working offshore improve their operations by bringing down the cost, and by improving safety and efficiency. What are the key challenges you’re facing? Local administration and regulatory bureaucracy is not always clear, but that’s the case with a lot of countries. Once you accept that, it becomes easier to adapt. What are the opportunities you are looking at in the Middle East region? Middle East will always be one of the main drivers of offshore industry. Our biggest opportunity is working together with local and national companies, helping them in their journey to remain global influencers and leaders. Safe offshore transfer is and should be at the forefront of that journey. What are the new products showcasing at EGYPS? WAVE-4, our latest product, is being showcased at EGYPS. WAVE-4 summarizes our efforts to support companies bring their cost down while not compromising on safety of their crew transfers but rather improving them.